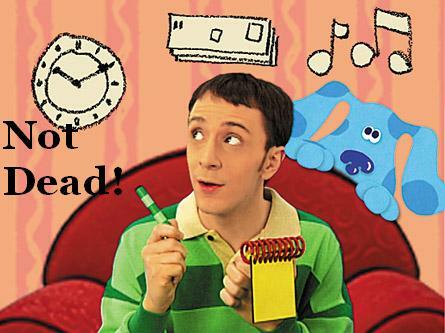 Paul: Steve From Blue’s Clues Not Dead! …don’t believe the internet rumors! One could easily have inferred that he’d murdered Steve and taken over his life, the dog eventually coming to accept him. I admit that several years a go I might on occasion pause for a few moments to watch Blue’s Clues while flipping through channels. This is purely bacause Steve was kind of cute. There’s no chance of that happening with this new guy. 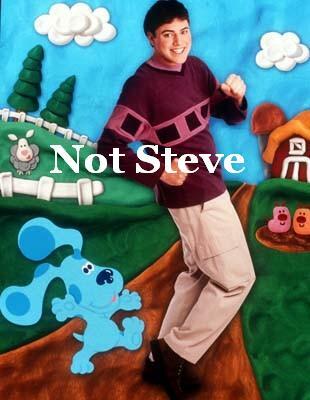 I bet there was a huge drop in ratings following Steve’s departure as mothers no longer had any interest in watching the show with their kids. Anyway, Steve is alive and well. He even has an indie rock band called “Steve Burns (and the Struggle)” and they’re on Myspace. While the music isn’t my cup of tea it’s worth a listen. I’m not sure why he gave up his Nickelodeon stardom, I guess filming in front of a blue screen for hours on end finally took it’s toll. Do you remember how Little Pete of Pete and Pete went to Hampshire? Someone told me once that all the rumors about Steve really made him mad, and he would say “it’s fucked up! he’s a really nice guy!” Oh, what a crazy world.